This roadmap update has been much-delayed, as we have juggled priorities and sweated security releases on the AVIARY_1_0_1 branch. Sorry for the delay; I will keep the roadmap up to date much more frequently from now on. 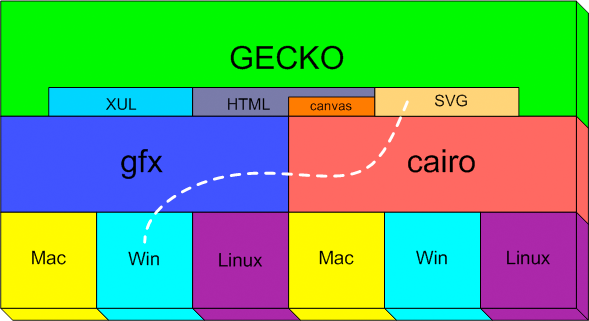 The main point is to focus near-term work on the Mozilla 1.8 milestone, which is the basis for the rv:1.8 Gecko codebase in Firefox 1.1 and XULRunner. We would like to branch 1.8 by the end of June, in order to open the trunk up for general Mozilla 1.9 alpha 1 milestone development. Sooner would be better, and later is hard to justify. A high priority for Firefox 1.1 at this point is to finish the end-to-end support for the incremental app/extension update work being done based on bsdiff, which has been spearheaded by Darin Fisher. We have also made several major architecture changes (e.g., XPCNativeWrapper automation) for improved chrome scripting security, with one more to land, so security is another high priority that may justify late-breaking changes. Apart from update and security, we won’t take any big changes on the 1.8 branch, instead focusing on quality and polish. So now is the time to cut low-priority or “nice to have, but …” items from your 1.8 buglists. Pending testing results from Deer Park Alpha 1, which just released, we will have a better idea of the order of work remaining. We will construct a detailed schedule for the rest of the release. Until we have a more “real” schedule, the roadmap will be fuzzy about dates. Apart from the absolute priority that Firefox 1.1 be able to update itself in small background-downloaded increments, and that its security and quality be at least as high as Firefox 1.0.x, we have already enabled new platform features such as SVG and <canvas>. These new richer-graphics-for-the-web features are in usable shape, and they deserve testing and experimental usage in XUL and even HTML. We want developer feedback, which we will incorporate into future releases. 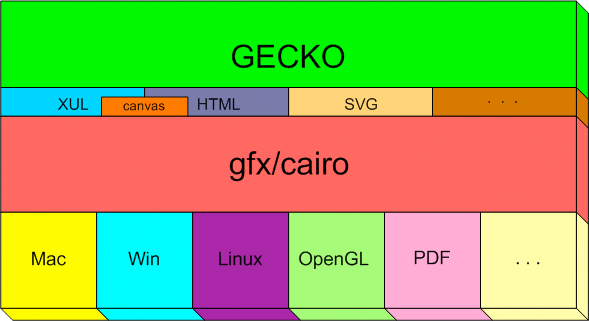 We are joining forces with the Cairo Graphics project (this will be no surprise to anyone following the project, in particular roc‘s blog). Together, we can move faster and on more platforms, toward a hardware-accelerated 2D future, and beyond. As with any large rearchitecture, there will be bumps along the way. But we are not going to rewrite the world at once (never again!). We aim to make changes in smaller increments, that can be done during the 1.9 alpha cycles. So the 1.9 schedule, which I won’t even bother to depict yet, will have a good number of alphas. Anyway, this is a blog item’s worth of roadmap content, which will show up in a more polished form in the main roadmap soon. Your comments are welcome. Mozilla had a strong presence at XTech last week. To my mind the high point was the awesome spinning-SVG-containing-HTML demo that roc gave. This happens to resemble an early Avalon demo (I can’t find a link to it, but I believe there was a video on the web some time after the 2003 Microsoft PDC), which just shows how the web can and will keep up with proprietary eye-candy — at least to a “good enough” degree. What’s good enough? Whatever it takes, including 3D graphics, in due course — but always incrementally developed and deployed, with web and XUL app/extension developers giving feedback and guidance. Web incrementalism (feedback-guided “little bangs” instead of one grand-planned “big bang”) was the leitmotif of shaver‘s keynote, and this meme reverberated throughout the conference. It seems even XHTML 2 is adapting to “mindshare” (similarity to the web-as-it-is, if not actual backward compatibility). That’s a hopeful sign, but don’t hold your breath for XHTML 2 on the web any time soon. It was amusing to hear that one of the design aims was less scripting, because scripting is hard for authors and constrains user-agent choice — when all user-agents will need major revision to support XHTML 2, which includes XForms (and meanwhile, the DHTML/AJAX/whatever-you-want-to-call-it JS renaissance continues). In the near term, only Mozilla-based browsers come close to having all the integrated infrastructure needed by XHTML 2, and not all bundled by default. There is no sign of XHTML 2 support from Microsoft, Apple, and Opera. Still, XML is making its way to the client side of the web, slowly but surely. To help handle XML in JS, I’ve implemented E4X for Firefox 1.1. It isn’t fully hooked up yet, but it will be soon. More in a bit, as I keep my renewed resolution to blog.